Words, a new temporary installation by Tacoma artist James Grayson Sinding will drop in Tollefson Plaza August 6 at 2pm. 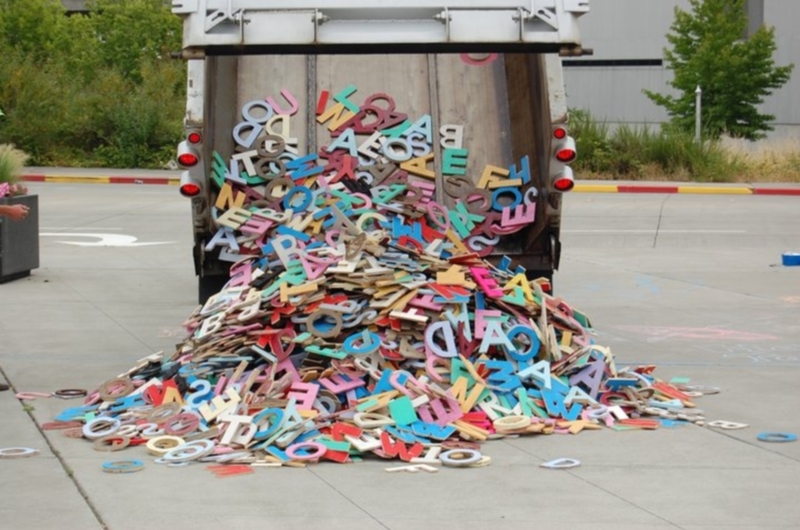 Come be part of the installation as Sinding dramatically dumps hundreds of hand-painted wooden words, refrigerator-magnet-style, onto the plaza out of the back of a shiny dump truck. The public is invited to create messages, climb, stack, and otherwise interact with the new installation. Words will be in Tollefson Plaza through the end of August 2011. Tollefson Plaza is located in downtown Tacoma at Pacific Avenue and S. 17th Street. 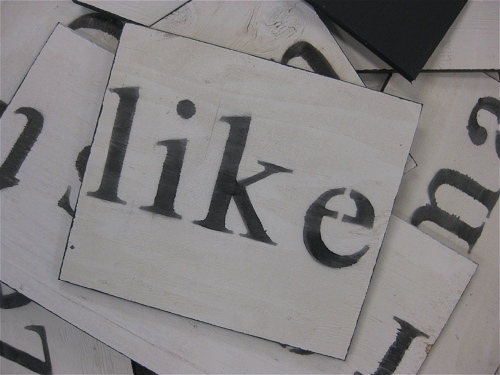 "Words," like "Letters," will be an interactive installation. In 2010, Sinding presented his colorful, award-winning installation, Letters, in Tollefson plaza. Letters was recently recognized by the prestigious Americans for the Arts 2011 Public Art Network Year in Review as an example of an outstanding public art project. This year a record 430 projects were submitted from across the country and only 47 were selected. A full list of projects and more information about Year in Review can be found at www.PublicArtNetwork.org. Words is supported by Spaceworks Tacoma and the Tacoma Arts Commission’s Tacoma Artists Initiative Program (TAIP). The installation is presented in conjunction with the Tacoma Art Museum’s “Free Summer Community Festival: Best of the Northwest.” The event runs Saturday, August 6, 10 am-4 pm. Admission to the museum is free during the festival. For more information, visit www.SpaceworksTacoma.com, www.TacomaArtMuseum.org or www.JamesGraysonSinding.blogspot.com or e-mail rsolverson@cityoftacoma.org.